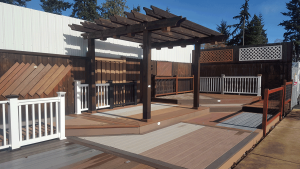 Angeles Millwork & Lumber Company and Hartnagel Building Supply offer a wide variety of non-traditional decking. Composite, Capped Composite and PVC decking are popular options among a growing number of homeowners because of low maintenance, resistance to moisture and increased longevity over traditional wood materials. Hartnagel Building Supply has an outdoor showroom with examples of all the products we carry to see the impact of the environment as well as to compare and contrast available options. 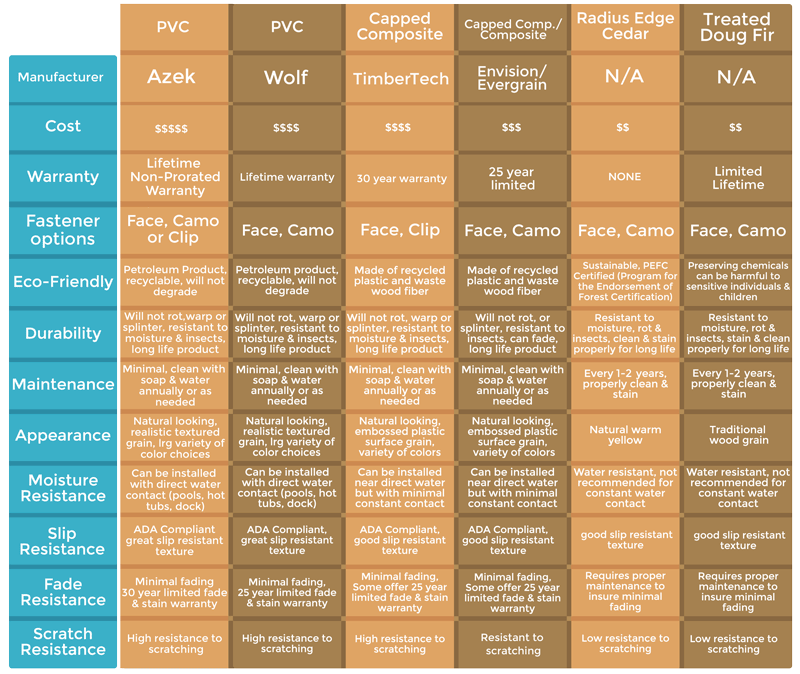 Be sure and read our recent Blog post for greater information on non-traditional decking options and a decking comparison chart HERE. Want a printable version of this page? Click HERE! Choosing the right decking materials can be a confusing experience and we want our customers to feel confident in their decision. We hope that this page helps to clear up any uncertainty and leads to making an educated purchasing decision. We encourage you to use this information in conjunction with one of our sales professionals to ensure that you receive the best decking material to fit your needs. PVC decking continues to be the top contender as a deck building material. Its uniquely all-plastic makeup makes it distinctly different from wood decking or other composite decking options. PVC decking has changed in appearance since its introduction and is now available in different colors and textures. PVC decking offers the most significant warranties against fade, stain, and mold resistance. They are low-maintenance and are typically easy to clean with no staining, sanding, or painting required. The product is significantly lighter compared to wood composite products. Compared to other synthetic decking products, PVC is the most expensive. The 100% PVC makeup of the board makes it costlier than the wood powder/plastic mix used in composite decking. This means that PVC will be a more expensive investment up front, but the long life, low maintenance and great warranty benefits make it an economical decision in the long run. Capped composite decking has a composite core with a durable veneer like cap that provides added protection. The cap is designed to provide increased fade, stain and scratch resistance. Capped composite decking is more expensive than normal composite decking because of the more involved process of adding the second co-extruded layer to the board. 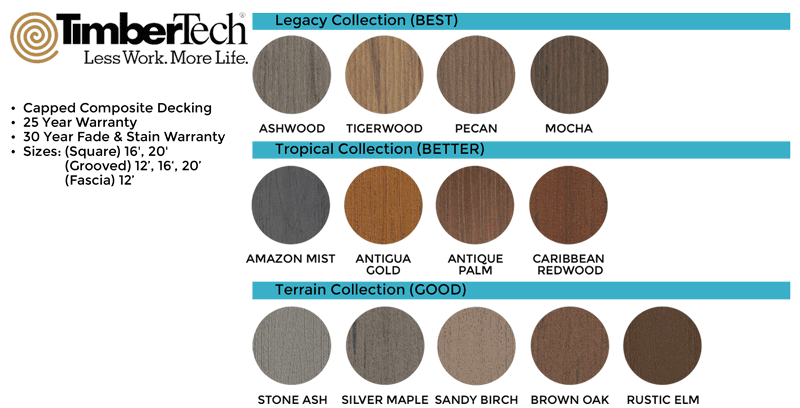 New colors to the Legacy Decking Collection for 2018 are Sequoia, Espresso, & White Cedar. See them all HERE. Working with composite lumber is similar to working with wood, however composite lumber has the added benefit of being much less likely to split, crack or warp. Most composite lumber is also engineered and warrantied to be stain, fade, and mold resistant, resulting in a product that typically has a longer life than traditional lumber. Composite lumber comes from the manufacturer as a finished product in lengths of 12’, 16’ & 20’. There is no need to stain, sand or paint the material. The initial investment is likely to be higher, but the long life and maintenance requirements makes it more economical in the long run.